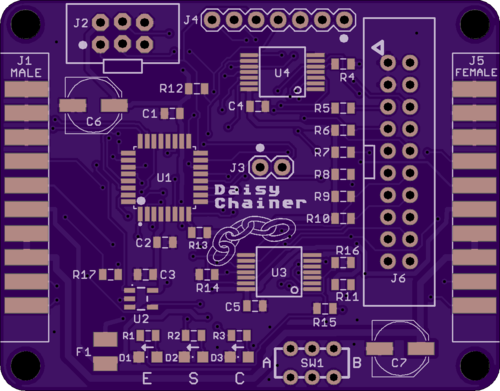 The Apple II Daisy Chainer for Floppy Emu is done, and I’ve ordered a few PCBs made for testing. This proved to be a surprisingly challenging board to lay out and route the traces. It’s a simple two-layer board, and I wanted to keep it as small as possible, so the signal routing quickly became very congested. Hand-routing of the first 40 traces took almost a whole day of tedious work, so I finally gave up and tried autorouting the remaining 80 traces. And it worked! The result looked pretty good, too. I’m curious to know how autorouting has turned out for other hobbyists. Have you ever autorouted nearly an entire board? What were the results? I haven’t had good results with Eagle’s built-in autorouter, so for recent projects I’ve been using a stand-alone autorouting software package called Freerouting. It’s a Java-based app with a slightly awkward UI, but it’s impressively powerful. First you export your Eagle board file in .DSN format, using a script provided by Freerouting. Then you import the DSN file into Freerouting and let it work, running for about 1 to 15 minutes. When it’s finished you can export an Eagle session script, which will rip up all your old tracks and lay down the new ones calculated by Freerouting. Obtaining good autorouting results requires careful setup of Eagle’s design rules. For example, the default might be to use 8 mil traces with 8 mil minimum spacing between traces, but power and ground might be treated as a separate net class requiring 20 mil traces for extra current-carrying capacity. The design rules also define what size drill to use for vias, and how close to the edge of the board it’s OK to route traces. The autorouter takes all of these constraints into account when it does its job. So what’s not to like about the autorouter? Can a skilled human do a better routing job? Why not autoroute everything? Here are a few drawbacks that I found. Fixed Component Placement – When I route by hand, I’ll sometimes discover that I’ve placed a component in the middle of a chokepoint for PCB traces. If the placement isn’t critical, I can move the component to make routing easier. The autorouter can’t do this, at least not that I’ve seen. It treats the component placements as fixed and immutable, even when nudging a resistor 10 mils to one side could make a huge difference. In theory there’s no reason that the autorouter couldn’t handle changing component placements. Additional constraint information could be supplied, providing a bounding box of acceptable placements for each component, or tagging some component placements as critical and non-movable. Unnecessarily Aggressive Routing – If the design rules say that 8 mils is the minimum acceptable spacing between traces, the autorouter will often stack traces 8 mils apart even when there’s plenty of room for wider spacing. It’s too aggressive – pushing spacing to the limit when it doesn’t need to. In theory this shouldn’t be a problem, but it feels like poor design practice to me. To avoid the risk of accidental short circuits, I prefer not to push the PCB manufacturing limits except in those few areas of the board where there’s no alternative. A good example is autorouting between adjacent pins of a 0.1 inch header. There’s roughly 30 mils of space between the metal rings that surround adjacent pins, providing enough space for an 8 mil trace with 11 mils of space on both sides. But Freerouting often placed such traces off-center, with 8 mils of space on one side and 14 on the other. It met the design rules, so from its viewpoint there was no reason not to do it that way. In practice an 8 mil minimum spacing is already conservative, and most PCB manufacturers can do 6, 5, or 4 mil minimum spacing. So it’s unlikely this behavior will cause any trouble here, but it might for other boards with smaller minimum spacings. Nuances of the “Best” Routing – Once Freerouting finds a routing solution, it tries to optimize it by minimizing the total trace length and the number of vias. These are good optimizations, but sometimes I want other considerations to trump them. For example when I route manually, I try very hard to minimize vias in power and ground traces. I would be happy to add 5 extra vias elsewhere if I could eliminate one via for power or ground. Freerouting doesn’t support this kind of trade-off, so all vias are treated equally. A related consideration is the number of power and ground paths. The autorouter considers a pin to be powered if there’s any combination of traces leading from the power supply to the pin. Only one such path is required, and the result is a logical tree with the supply at its root and the power pins at the end of the branches. But when I route manually, I often connect branches back together, creating multiple paths from the power supply to the pin. I use the same approach for grounds. The goal is to minimize the voltage difference between power and ground points on different regions of the board. The autorouter doesn’t care about visual aesthetics, and normally I don’t either. But when two possible routes are equally effective, I normally choose the one that’s similar to other traces I’ve already routed. It makes the board’s interconnections easier to understand at a glance. Freerouting also doesn’t account for any potential analog signal effects, at least not that I’ve seen. If it’s important to minimize the trace length for a specific signal, or match the trace lengths of two signals, it can’t help. It also doesn’t consider problems like the parasitic capacitance formed by two long parallel traces. Depending on the signals, the signal speed, and other factors, a skilled human might choose to route two signals on non-parallel paths even if parallel routing was the shortest distance with the fewest vias. Do you have any autorouting secrets to share? Let’s hear them! If you’ve ever used an Apple II computer, then you’ll remember the click-clack-whack sounds of a 5 1/4 inch floppy drive. The internal stepper motor moves between tracks on the disk, and every step makes an audible sound. When the computer first boots, it makes an unforgettable buzzing sound as the stepper is repeatedly whacked into the mechanical stop at track 0. By comparison, running an Apple II with a Floppy Emu disk emulator is silent. Should we add back some of that old-fashioned noise? I was considering integrating a click relay or speaker into the much-discussed Floppy Emu daisy chain adapter. What do you think? After running these tests, I’m less excited about the idea than I was initially. It’s fun for a few minutes, but after that I’m concerned it would grow irritating. I could include a disable switch, but it seems foolish to incur the expense and design time of adding this extra feature if most people will turn it off anyway. Relays and speakers aren’t exactly cheap either, at around $1.00 to $1.50 in the quantities I’m looking at, making them more expensive than a microcontroller. Rapid on-off switching of the coil or speaker current will also generate electrical noise in the power supply and disk I/O signals, increasing the chances of disk errors if the signal quality is already marginal. So even if cost isn’t an issue, malfunctions are still a risk. Of the two versions, I think I prefer the relay’s more authentic sound, but the speaker would be easier to work with and probably less likely to cause electrical trouble. Either one could work. Aside from the difference in tone, the speaker also produces a different series of clicks than the relay. The speaker can respond more quickly to changes on Phase 0, while the relay’s mechanical design likely misses any Phase 0 pulse that’s shorter than a few milliseconds. If most people feel this is a compelling extra feature, and they wouldn’t mind the few extra dollars in cost, that’s great. But if the reaction is more mixed or merely “would be nice”, then I’ll probably leave it out. Vote for your preferred Floppy Emu daisy chain design option! I’ve been working on this concept for several weeks, and wrote about it here, here, here, and here. I’ve now realized there are two different paths I could follow, with different feature sets and likely costs. For those who are potentially interested in the daisy chain adapter, I’d like to know which option you’d prefer. Option 1 is what I’ve been discussing all along. 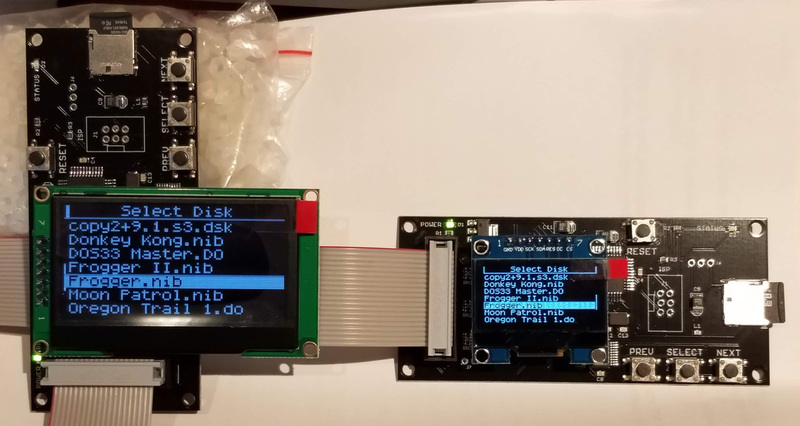 It’s an intelligent adapter based on a microcontroller or CPLD, that allows for pretty much any valid combination of Floppy Emu mode and daisy chained drive types. It auto-detects the modes and types, so there’s nothing to configure. It has some LEDs to show the detected types or other debug info. And it also fixes some other minor problems with Floppy Emu daisy chaining like this one. I’m about 90% sure it will work, but there may be weird rare bugs. Retail price will likely be somewhere in the 30’s (very rough guess). Option 2 is a “dumb” adapter, somewhat similar to the retired Universal Adapter for Floppy Emu Model A. It’s a fixed configuration of a few 7400-series logic chips. It supports the most useful combinations of Floppy Emu mode and daisy chained drive types, but does not support all combinations. Drive types are not auto-detected, and must be manually chosen with a switch. There are no status or debug LED’s. It doesn’t fix the other minor problems. I’m 100% sure it will work. Retail price will likely be somewhere in the 20’s (very rough guess). For the sake of this discussion, Unidisk 3.5 emulation mode counts as Smartport. Note that neither option 1 nor 2 supports Emu Smartport with chained Smartport. Option 1 is certainly the most flexible, and has the best cool factor. With a change of firmware, it could even do other cool disk-related things I haven’t dreamed of yet. And I’ve already sunk a lot of time into designing it. But I can’t escape the feeling that I’ve lost sight of the core purpose and over-engineered a solution. There’s a lot to be said for a keeping-it-simple design, and that’s what option 2 is. Auto-detection is very nice, but is flipping a switch really so bad? Would anybody really miss the two disk configurations this option lacks? Option 2 could be built easily, but option 1 would have to be programmed and tested after assembly, adding time and cost. What do you think? Despite how much time I’ve spent working towards option 1, I’m leaning towards option 2. Because it’s probably more important that this thing works rock-solid in the common use cases, and is as affordable as possible, than that it has every whiz-bang feature that only 1% of people will care about. I’m still working away on the daisy chain adapter concept for Floppy Emu, and I’ve prototyped something that mostly works. 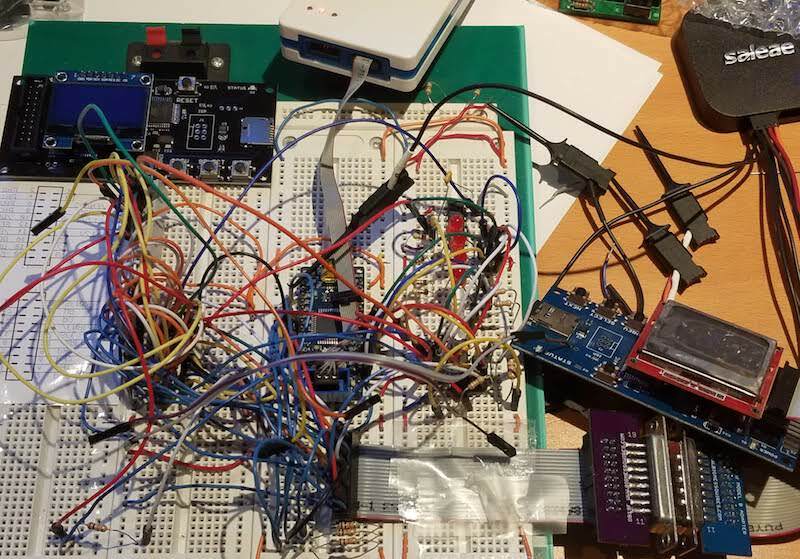 It’s a real mess on the breadboard. There’s an AVR microcontroller in there somewhere, plus some open drain buffers, some NAND gates… I think I also saw an engine controller from a 2003 Ford Focus. Yikes. I solved the pulldown problem described in my previous post by incorporating the proposed SR latch circuit. It’s imagined as a T adapter. Power and input signals will come from the computer or the upstream drive in the daisy chain. One branch of the T will connect to a Floppy Emu. The other branch will connect to a real disk drive, or multiple drives in a chain. From a logical perspective, these drives will appear downstream from the Floppy Emu. This will enable the use of complex multi-drive setups involving a Floppy Emu and other drives that may not be possible otherwise. My leading plan is to use a simple AVR microcontroller as the heart of the device. But since that’s far from an obvious choice, let’s take a look at some alternatives. Discrete logic – I could build the whole thing from common 7400-series parts like NAND and NOR gates, with a few extras for things like power-on reset. But the part count and total cost would be higher than the alternatives. It would also prevent me from experimenting with different logic equations and different behaviors. Parallel ROM – An 8 input, 8 output logic equation can be implemented as a 256 byte ROM. It’s reprogrammable. But the ROM wouldn’t help with the other needed elements, and in-circuit reprogramming of a parallel ROM is annoying. 5V ROMs are also increasingly rare and more expensive than the alternatives. CPLD – This was my original plan, and is still a possibility. Any combinatorial logic can be easily programmed or changed in a CPLD. But there are headaches. CPLDs don’t like to make latches. Without latches, I need a clock source, which some otherwise-promising CPLD types lack. Most CPLDs are also 3.3V or 1.8V, requiring 5V level shifters on both the inputs and outputs. AVR – Even the simplest AVR microcontroller can run at 5V, has a built-in clock, has a power-on reset circuit, and has built-in pull-up resistors. They’re extremely flexible for debugging or experimentation. And they’re cheap: for the cost of two or three 74LS00 chips, I can have a full-blown microcontroller. The combinatorial logic can be implemented in code. Read the inputs, do a table lookup for the logic function, set the outputs, repeat. Beyond some level, the combinatorial logic delay will cause disk errors. So how fast does it need to be? The short answer is 1) it depends, and 2) I don’t know. It depends, because some signals appear more sensitive to delay than others. From my limited tests, the PHI3 signal is much more sensitive than the /DRIVE1 and /DRIVE2 enable signals. So one option is to partially handle PHI3 with hardware gates, and do the rest in software. The exact level of tolerable delay is something I’ll need to test, and I’m not sure where the worst-case scenario lies. A PHI3 delay of 3.5 microseconds prevented a 3.5 inch drive from working, but 2.5 microseconds seemed OK. /DRIVE1 and /DRIVE2 appeared able to tolerate delays up to 20 microseconds. But I don’t completely trust those numbers yet. So what now? I’m attracted to the AVR solution, and I think there’s a good chance it’ll work, but I won’t really know until I design and build a PCB and test it thoroughly. There are too many problems with signal integrity and grounding in my breadboard circuit to fully trust it. I’m undecided how to handle PHI3. Maybe I’ll design a PCB that can either handle PHI3 in software or in hardware gates, and try both ways. Then I’ll need to design a second, final version of the PCB once I’ve found the timing limits. Onward! Figure 1 shows a Floppy Emu connected directly to an Apple IIGS. Figure 2 shows a Floppy Emu daisy-chained to an Apple 3.5 Drive, A9M0106. Apple designed a disk interface with double-purposed signals. Depending on the disk drive type, the data signal EN35 is either an input to the drive (3.5 inch drives), or is pulled low by the drive (5.25 inch and Smartport drives). The double use requires an open drain driver or inline resistors, to avoid potentially shorting power to ground if both ends drive the signal with different values. For equipment that’s “3.5 inch aware”, it can detect whether a daisy-chained drive is a 3.5 inch drive by monitoring the voltage of EN35. The SR latch in figure 2 shows one example. At reset, it assumes the daisy-chained drive is not a 3.5 inch drive. But if EN35 is ever observed to go high, then it knows the daisy-chained drive *is* a 3.5 inch drive. On a real floppy drive’s input, EN35 is either connected to an input buffer or tied directly to ground. But Floppy Emu can do either one, depending on the emulated drive type, and that’s where the problem appears. To protect the Emu’s CPLD chip when EN35 is treated as an input, there’s an inline protection resistor of 1K (Model B) or 330 ohm (Model C). When the Emu wants to pull down EN35, it must do it through that resistor. This forms a voltage divider with the resistor in the upstream equipment, preventing the EN35 voltage from being pulled fully to 0 volts. In figure 1, with the Model C’s 330 ohm pulldown, the voltage at Vt is pulled down to 2.0 volts. That’s not low enough for equipment (like my proposed daisy-chain adapter) to detect as a valid logic low. With the Model B’s 1K pulldown, the situation is worse, and the voltage at Vt is only pulled down to 3.3 volts. When the pulldown is inactive, the voltage measured at Vt is about 4.9 to 5.0 volts. In figure 2, with the Model C’s 330 ohm pulldown, the voltage at Vt is pulled down to 0.49 volts. That almost works, with correct behavior about 75% of the time. On the Model B with the 1K pulldown, the voltage at Vt is only pulled down to 1.16 volts. That’s not low enough, and the circuit doesn’t work correctly. By butchering a board and testing various resistances, I found that a 200 ohm pulldown works reliably. When Floppy Emu is driven from the Apple IIgs as in figure 1, I can control both the “magic circuit” and the buffer used to sense the EN35 voltage, so a solution is relatively simple. But finding a solution that works with the Apple 3.5 drive (figure 2) is more difficult, because that feedback path to the SR latch is outside my control. Passive Resistors – How about adding an extra pulldown resistor to bias the EN35 voltage lower? Or some kind of voltage divider? I don’t think that can work. An extra pulldown would need to be fairly strong in order to pull EN35 to a reliable logic low, so it could no longer reach a reliable logic high. Voltage Controlled Pulldown Booster – Maybe the magic circuit could monitor the EN35 voltage, and if it ever went below ~3.5 volts, the circuit could activate a second strong pulldown to bring the voltage to 0 volts. The problem with this idea is that it would create a feedback loop. Once the second strong pulldown was activated, it would hold the voltage at 0 and keep itself activated forever. Current Controlled Pulldown Booster – Maybe the magic circuit could monitor whether more than 1 mA is flowing into the Floppy Emu, meaning that the pulldown is active. Then it could engage a pulldown booster of some type to bring the voltage to 0 volts. This sounds like a job for a BJT, perhaps, but I’m not sure. Once the second pulldown was activated, I think all the current would flow through that pulldown instead of to the Floppy Emu, causing the booster circuit to shut off again. Maybe there’s a solution here, but I don’t see it. Bidirectional Level Shifter – I’m not actually doing level shifting here, but level shifters have the useful property of electrically isolating the two sides. The classic bidirectional shifter based on an N channcel MOSFET won’t work here, though. It prevents a high voltage from damaging a lower-voltage circuit, but does nothing to help if a low voltage source is too weak. Maybe there’s a solution based on some other bidirectional isolation technology? The only plausible path that I see right now is a state-based solution, similar to the SR latch that’s in the Apple 3.5 drive. This could be used to enable one of two buffers that isolate the sides of the circuit, such that the direction of data flow is always definitively in one direction or the other. Data flow would be assumed to go from the Floppy Emu to the upstream device until proven otherwise. And a weak pullup on the Floppy Emu side would compensate for the weak pulldown. I’m not thrilled with this solution, because it’s state based, requires reset circuitry, and overall seems cumbersome. I’ll elaborate more in a future post. Meanwhile if you have other suggestions, please leave a note in the comments box.